Simplicity and Success- Jig Fishing for Steelhead — Bent Rods Guiding & Fishing Co.
No one is quite sure when and who was first to discover that Steelhead love to eat jigs, but most fingers point to the Cowlitz river in South Western Washington state. The story goes that a diehard fisherman was rooting through his vest for something to tempt the rivers tight lipped steelhead, when he came upon a fuzzy little marabou jig, designed to catch pan fish and walleye. No more than a few casts later the float was ripped under and the river exploded with a chrome sided Steelhead taking flight with a jig firmly stuck in its mouth. Throughout the Pacific Northwest and the Great lakes area Steelhead fisherman are experiencing the kind of success float fishing jigs once believed only possible with organic baits. The method is very simple and requires little in the way of tackle requirements. I typically carry in my small fishing bag a half dozen foam floats, a spool of leader (typically 8-12 pounds), a handful of pre cut hollow pencil lead , some small barrel swivels and a small case of around 20 jigs. In colored or highly fished waters I will carry a small bag of cut up raw prawn pieces to tip my jigs with. The days of carting around a 50 pound vest are a thing of the past and hiking in the cold of winter or heat of summer are definitely more enjoyable. One of our clients impressive looking box of Bent Rods jigs. The topic of why Steelhead are so attracted to jigs is contentious, but I firmly believe the jig offers lifelike movement that triggers both aggression and curiosity. Float fishing jigs is very productive under all water conditions and I routinely catch Steelhead in water with 1.5 feet to unlimited visibility. In fact during low clear river conditions the jig is renowned for its ability to catch otherwise spooky Steelhead. Having sight fished for Steelhead on many occasions, I have witnessed fish move long distances in gin clear water to intercept an incoming jig. During the days of high colored water I have good success by using large gaudy jigs, made with bright colors and tipping with bait (scent being essential when visibility is limited). One of the great attributes of jig fishing is that your hook is weighted and this ensures your jig is quickly into the fish’s strike zone and stays there throughout your drift. In the course of a day this alone will seriously up your chances of catching the elusive steelhead. By design, a jig travels under your float with the hook facing up and backing toward the fish, the result is a firmly hooked fish that seldom gets free and a high percentage of jig caught fish are successfully landed. hile I have caught fish on all manner of crazy looking jigs, a simple selection of a dozen colors with some bigger “attractor” jigs and a few smaller “finesse” jigs will be all the angler needs to realize success under all conditions. 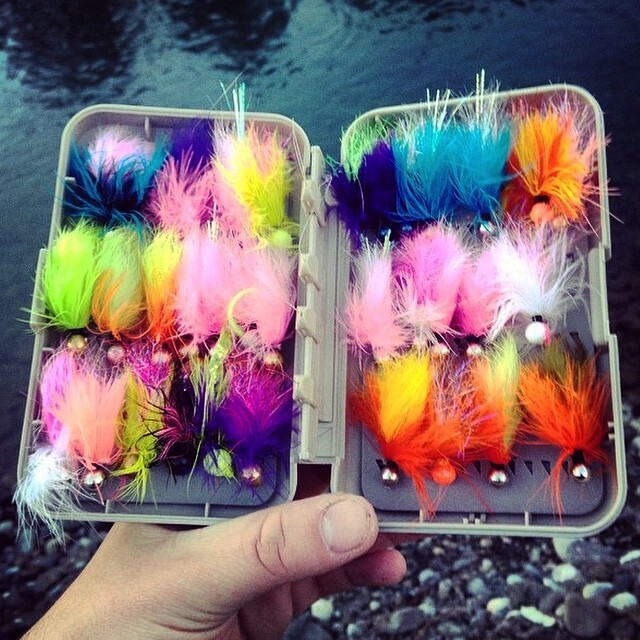 Jigs made from marabou, schlappen and bunny fur are most common and all great choices. Favorite colors typically include, pink, cerise, purple, red, orange, and white and most often two colors are mixed for contrast. In dirty water I always use chartreuse and when the river is clearest I favor black and olive. Much like fly fisherman the jig fisher is only limited by his own imagination. Tying jigs is relatively easy to take up and vastly rewarding. Nothing quite compares to catching a beautiful Steelhead on a creation you have designed yourself. Steelheaders are typically tinkering types and the crazy looking creations that I have seen tied the night before a trip, make me laugh out loud. Often these same jigs are the hot ticket the following day and the proud creator gets the last laugh. Some things to remember when fishing jigs are; adjust your float so that your jig is at least a foot off the bottom, allow your float to travel at a natural pace(do not hold back), and mending your line can help you achieve a natural drift. The main thing to remember is a tension free jig will pulsate tantalizingly in the current and attaining this is the key to success with jigs. Jigs are a very versatile lure; they excel in the fastest boulder strewn runs and are renowned for their ability to take steelhead in those froggy slow moving river sections that many anglers never bother to fish. In essence, all water is jig water. I recall a cold winter day a number of years ago, the fishing on the Vedder River was extremely tough due to the extreme low flows, many anglers were getting skunked. I arrived at a popular run to find at least 10 anglers fishing it from the opposite side from me. You could clearly see the Steelhead hiding in the depths of the run and most of the anglers were dredging along bottom and the fish were obviously spooked by this. I searched through my bag for an olive jig I had tied for just such occasions; I call it the “natural”. With my polarized glasses it was very evident the Steelhead were holding well off the bottom to avoid the procession of lines dragging the floor of the river. In the next half hour I landed five steelhead and lost a few others and I’m pretty sure the other anglers were off to the tackle store looking for some jigs. The key to my success that day was using a naturally colored lure that did not spook the fish and keeping it above the fish in their “window” of vision. The next time you head out Steelhead fishing, try leaving the vest behind, pack a small bag or knapsack with some jig fishing essentials and you too may experience “simplicity and success”.